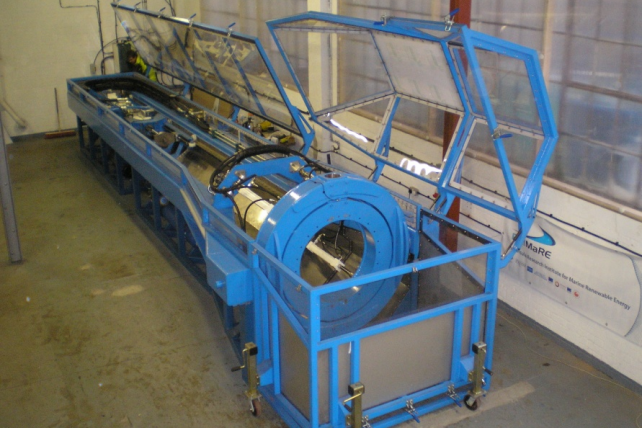 The test rig comprises of a linear hydraulic cylinder that can be used to replicate any pulling (tension) and pushing (compression) force representative of dynamic loadings, pre-loadings, etc. (termed the Z actuator in the tailstock position). At the other end of the rig the moving headstock with three degrees of freedom (namely pitch, roll and yaw) representative of x- and y-bending or torsion allows to replicate the movement and forces (e.g. bending moments) induced through the motion of a floating body. The rig is capable to replicate tensile forces of up to 30 tonnes in dynamic and 45 tonnes in static operation. The maximum bending angle at the headstock is ±30° for x- and y-bending. The rig can test specimens up to a length of 6 metres. Beyond that, the rig has the unique feature that components can be immersed in fresh water to allow the testing in a wet environment. These features allow a dynamic testing of components in large scale under controlled environment applying realistic motion characteristics.